Explore: Find opportunities and customers. Visualize your market. Use Explore to see your market, identify key insights and trends, and find new customers by starting a location-based list. "You gotta see it to believe it!" Explore is a powerful, fast, and efficient way to process massive amounts of data. How? Explore takes advantage of your natural ability to recognize patterns visually. Start making a list of your best potential customers or deals. Use Explore on your smartphone to make Driving for Dollars (D4D) an amazing and efficient experience. 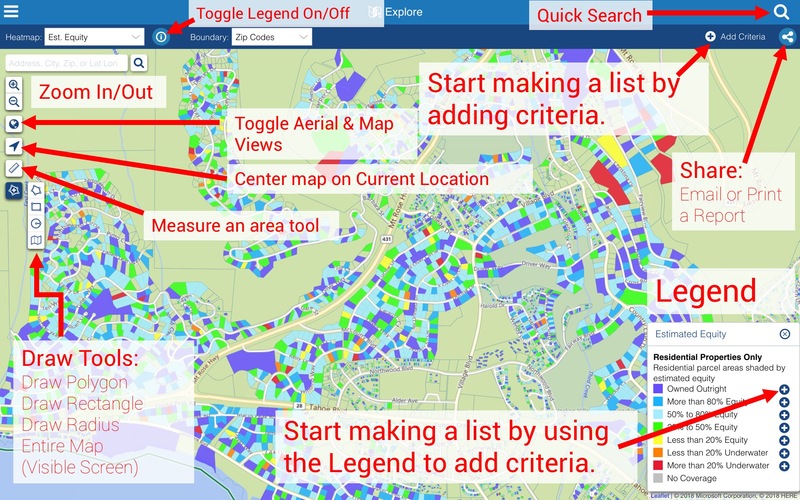 Heatmaps and Boundaries are drop-down menus from the top application bar and includes 23 heatmaps and five boundaries. Using any of these methods converts the Explore user interface into the Make a List user interface. Additional criteria can be added to target your best potential customers.